Home / Brooklyn / Brooklyn GOP / Brooklyn GOP Radio / Eric Garner / Gene Berardelli / Michael Mulgrew / nypd / Pat Lynch / PBA / People's Republic of New York / Rev. Al Sharpton / Russell Gallo / Staten Island / UFT / UFT Head Backs Rev. Al, You Won't Believe Members' Reactions! UFT Head Backs Rev. Al, You Won't Believe Members' Reactions! The United Federation of Teachers, lead by Michael Mulgrew, has decided to go against the NYPD by sponsoring and joining forces with Al Sharpton's anti-police rally to be scheduled for this Saturday August 23 in Staten Island. And UFT members are voicing their outrage on social media. The UFT represents over 200,000 members of the city's public school teachers are now one of the four sponsors of this planned protest, which includes NAACP and SEIU. This prompt action to sponsor this protest shows how unions are siding with the wrong issues and causes. It just goes to show you that union leaders don't respect or care about what their members thinks. Mulgrew didn't even consult with UFT union members or scheduling a vote to take the pulse of membership before signing on board with Sharpton's agenda, which is attacking other unionized public employees. Many teachers have taken to social media to rail against the UFT leadership for joining this protest. On the Facebook UFT page, dozens, if not hundreds, of angry comments from teachers indicates how furious some are with their union for wasting their dues and aligning with a protest that does not involve education or students. UFT members are apparently angry with their President for getting their union involved in a no-win situation. Many support the NYPD and have friends and family on the job. Others don't want to turn on another union. Still others feel that association with Rev. Al and this protest is distasteful and that marching on the Verrazano Bridge will disrupt commuters traveling to and from Staten Island while losing transportation funds. Whom union members decide to line up with is their business. However, this rally is blaming unionized police officers as a whole for the death of Eric Garner, even though the investigation into the matter is still ongoing. Pat Lynch, president of the PBA, which has 35,000 members, stated Mulgrew and the UFT has declared a "war on members of another municipal union". Continuing on, Lynch said, "How would [Mulgrew] like it if police officers lined up with the activists who oppose his efforts to shield bad teachers and undermine effective charter schools." Lynch is totally right to be angry with the UFT for joining forces with the likes of Rev.Al Sharpton. City workers should be supporting each other. They should not support an event created by a buffoon and a race-baiter that causes trouble with the NYPD. He’s also right that all this nonsense comes at the expense of children, who will see the message that it's OK to disrespect authority. I'm sure mom and dads everywhere are thrilled with that. Mulgrew should be worrying more about high dropout rates, overcrowding schools, gangs and bad teachers failing our students in education. Instead, he chose to partake in an event without letting union member decide if this was a good call to join that diminishes his union in the eyes of many. If Mulgrew wanted to join the rally individually, go right ahead! It's a free country, do whatever you want. But don’t involve your union members, many of whom respect the NYPD, who are also friends and family members. Pitting union against union is distasteful and shows lack of leadership. It is a disgrace to support this rally that has nothing to do with education or teachers. If Mulgrew doesn’t respect his members and withdraw its sponsorship and apologize to the NYPD, then union members should oust him. To support and back Rev. Al Sharpton, an opportunist who is only out for himself, is plain stupid. Would Rev. Al ever support a UFT rally or called for better education for minorities? Doubt it, unless there's something in it for Rev. Al. Another sign of progressivism run amok in NYC. Anyone other than me miss Rudy Giuliani yet? Before the UFT supports ANY Mulgrew-ordered demonstrations of support for garbage like Sharpton, maybe they should get their own house in order first and get rid of that rabble-rousing, insult-filled bum. When's the last time Sharpton ever marched in "solidarity" with the UFT for anything that didn't serve HIS self-aggrandizing interest, huh? 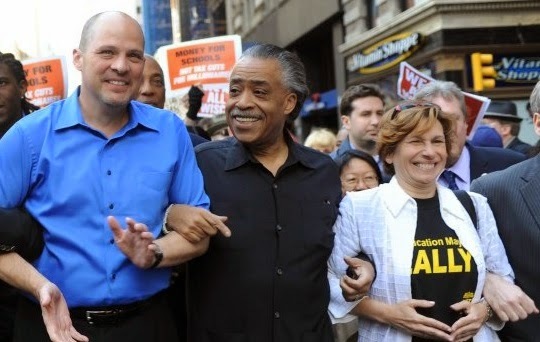 The picture of fat-now-thin Al in lockstep with Mulgrew and Weingarten is testimony how that charlatan made the UFT and its membership look like the useful idiots that they were that day. I respect all who are proud members of the teaching community, but it's high time these folks stood up for themselves and told hacks like Mulgrew to take a hike.